Translating Cheryl Strayed’s 2013 sort-of memoir Wild: From lost To Found On The Pacific West Trail to the screen must have been a daunting task for everybody involved; it really isn’t a text that seems like fertile ground for cinematic reinvention, it’s not crying out to be displayed on the big screen. Part of the problem is that Wild is a story without a lot of story; the general narrative follows Cheryl Strayed after the untimely and painful death of her beloved mother Bobbi. Strayed begins to take heroin regularly, cheats on her husband, is dismissive of friends, takes part in frequent and upsetting sexual encounters with strangers, becomes homeless and strong arms herself into a painful divorce. At her lowest point she reads about the Pacific Crest Trail, a trail that runs from the Mexican border to Canada, and decides to embark on the nearly 3000 mile journey. The book is an intensely personal, difficult, scrappy account of one woman’s attempt to walk out of her damaged present and walk into some kind of buoyant future. It’s a punishing read; meandering and oppressive, hopeful and hopeless, raw and enlightening. Thankfully, the film manages to retain all of those elements – twinning the literary with the cinematic cleverly to create a film that leaves the audience exhausted and bruised and exhilarated. Jean Marc Valee, who directed the similarly difficult and surprising Dallas Buyers Club, captures the beauty and fearsomeness of the trail – the film is, somewhat surprisingly, an astonishing visual treat. The expansive locations and unpredictable weather patterns becomes characters unto themselves – mirroring Strayed’s emotional terrain and bringing an excitement and exterior life to an extremely internal narrative. Wild has genuine texture; colours overlap and disappear, the camera plays with perspective, words appear on the screen and days meld into each other to create a visual palette which is destabilising and disorientating. One sequence, in which Strayed remembers having to put down her mother’s cherished horse, is one of the most visually upsetting and frightening on the year; revealing a director who has great sensitivity but also one who values visual impact. His direction is dreamy and startling and only very occasionally slips into film school pretention. Much like the book on which it’s based, Wild is a story told in flashbacks, flash-forwards and non-sequiturs; it doesn’t follow the traditional Hollywood story structure and that can be confusing and bracing. The film starts in what would traditionally be the middle of the story, at a moment of emotional catharsis that doesn’t make sense to the viewer until much further into the movie, and the screenplay has a blatant disregard for the rules that govern most narratives that we consume. Nick Hornby’s screenplay deserve applause for maintaining this free-associative style from the book; allowing the story elements to blend together in ways that don’t always provide the audience immediate gratification. This makes the conclusion all the more satisfying; the, sometimes disparate, threads of the screenplay eventually come together in a deeply moving and heartfelt denouement that is informed by the splintered nature of the script. Hornby isn’t afraid to place a spotlight on Strayed’s pain and vulnerability – he examines her journey shrewdly and resists the urge to soften the character in order to make her more palatable to the viewer. He creates a three dimensional, wounded, strong, violent, kind female protagonist and places no judgement or restraints on her. Hornby does a good job of expanding the text to make it more cinematic – but the process results in moments that feel out of place and rushed, as if the movie could spin out of control at any moment. The moments directly after Bobbi’s death are devastating, grotesque and feel like a gut punch; but Hornby doesn’t allow the audience time to process the imagery and emotions that he throws at the screen. It’s as if he wants to throw a punch and run away before he can witness any of the damage. Sometimes you get the impression that the screenplay is so afraid of being seen as sentimental that it doesn’t allow itself the room to feel its own emotions and the implication of those emotions. That being said, the script cleverly zooms in on Strayed’s original text by making large chunk of the movie an internal monologue. You hear Strayed’s thoughts as narration to her journey – which provides an emotional thrust and an intimacy to the whole thing that feels wonderful and draining. 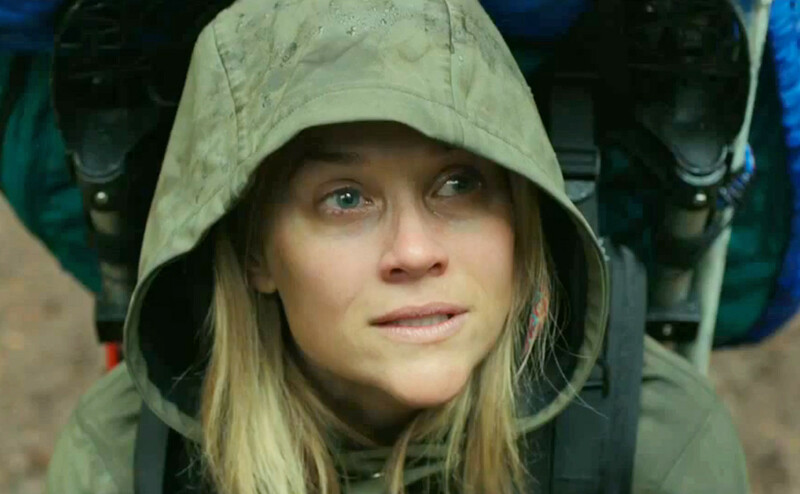 Reese Witherspoon appears in nearly every scene of Wild and she puts in an intuitive, smart, vividly drawn performance that feels like a departure for her as well as a homecoming. Witherspoon is rarely less than compelling – but here you sense that she is an actress at the height of her powers, one who is confident enough to take risks and bold enough to stand by some daring choices. It’s a performance rubbed raw by grief and informed by hope. The nature of the script demands that she play Strayed at several different ages which she handles easily; she captures the exuberance and casual cruelty of the character as a teenager and, more impressively, the woman who is looking back at that behaviour after years of triumphs and defeats. It’s a layered and fierce showing which shows a genuine maturity and intellect. Witherspoon is able to provide depth and meaning to the narration that characterises many of the scenes, something that becomes vitally important during the movie’s final monologue, and finds a way to embody the physicality of a woman who is both over and under prepared for the task that lays ahead of her. When Strayed and her husband are shown posting their divorce papers, a small and inconsequential scene, Witherspoon makes the moment heartrending in three or four seconds and she even manages to bring humour to what is often a gruelling story. It’s a tough performance and it’s not always easy to watch; but as a portrait of a woman who has to emerge from the rubble of her own life – it’s spot on. Laura Dern plays Bobbi and is typically luminous; humane, kind, intelligent, honest and gorgeous. It’s hard to recommend Wild – but for all the right reasons. It’s painful and moving and searing and has an energy of dog-eared tragedy. It asks questions that it has no intention of answering. It doesn’t hold your hand and that is startling; it’s hard to imagine that it will be universally appealing because it offers such a wrestling match of thoughts, feelings and emotions. It side steps the more easily gained platitudes that make some people roll their eyes at somewhat similarly themed movies like Eat, Pray, Love and Under The Tuscan Sun, but in doing so makes itself barbed and challenging. Ultimately, Wild is a story about the things that loss can give you and the things that it inevitably takes away, about starting again at the exact moment when your life becomes unviable, about finding yourself when you don’t recognise your own face in the mirror. At one point in the movie Cheryl’s ex-husband says ‘I’m sorry you have to walk three thousand miles just to…’ and she replied ‘just to what? Finish that sentence…’ unsure of why she is taking the journey and what she could possibly gain from it. The biggest compliment I can give the film is that she finds what she’s looking for and, in some small way, so do we.